SOCHI, Russia ― The official Olympic motto means "faster, higher, stronger," but the luge competition at these Winter Games has deliberately been slowed down. The death of 21-year-old Georgian athlete Nodar Kumaritashvili after a practice-run crash the day of the Opening Ceremony in Vancouver four years ago prompted a drastic rethink in the sport's safety measures. Extra emphasis has been placed on the wellbeing of the contestants. Kumaritashvili's death rocked the 2010 Games and it still casts a shadow over the Winter Olympics movement. A moment of silence was held to commemorate him on Wednesday, but questions remain about how much the Games and the luge world should remember the young man from Bakuriani, a Georgian mountain town just a few hundred miles from Sochi. One thing is certain: The speeds reached at the Sanki Sliding Center will be significantly slower than those at the Whistler Sliding Centre in Vancouver. Uphill segments have been added to the course to decrease the velocity of the sleds and prevent the treacherous conditions that caused crashes and fear among athletes at Whistler. "A lot of safety precautions have been done not only to Sochi and Vancouver, but to every track around the world," American Olympic luger Chris Mazdzer said. "There's a lot of effort put in to reassess everything we're doing and the speed that we're going at and to make changes if necessary. "I'm extremely happy with the work that they've done and I feel really good going to Sochi." In Vancouver, changes were made immediately following Kumaritashvili's crash. Before competition began, the starting line was moved further down the hill to lessen the chance for any buildup toward extreme speeds. Even before the 2010 Games, luge chiefs realized the sport was getting quicker partially due to the ever improving technology in the sleds and alterations were already being put in place then for Sochi. 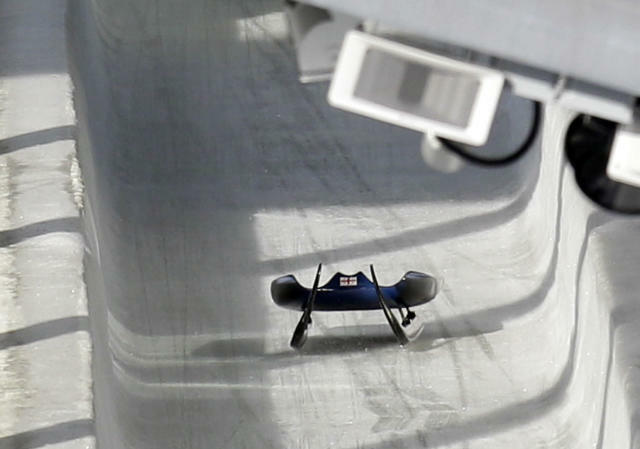 "The speeds had to drop," said Josef Fendt, president of the International Luge Federation. Kumaritashvili lost control and became separated from his sled, the speed and momentum forcing him off the track and into a collision with a metal support. Medical staff rushed to his side and began to attempt resuscitation before he was airlifted to a Whistler hospital, where he died of his injuries. A moment of silence was held at the Opening Ceremony, and the Georgian team wore black armbands and received a standing ovation at BC Place. In Kumaritashvili's hometown, there remains confusion. His mother, Dodo, still prepares food for him every day and has twice tried to commit suicide, according to a New York Times report. The family is split on whether to start a lawsuit, and they are angry at suggestions that Kumaritashvili's inexperience caused the crash. An official report declared the accident was not caused by an unsafe track. For luge athletes in Sochi, memories of one of their sport's darkest hours are still fresh. "It affected all of us and it was a tragic situation and it definitely hit us all pretty hard," said Erin Hamlin of the U.S. "Luge is a pretty small, tight-knit community for an Olympics sport. For me personally, it definitely put a damper on my competition in Vancouver, but since then I know a lot has been done to make sure athletes get enough training." The 2014 competition might be the slowest Olympic luge for years, and more uphill sections can be expected at future Games. Because safety is paramount, according to Fendt, who was confident that adequate steps had been taken to prevent a repeat of the tragic events four years ago. "I sincerely hope this will never happen again," Fendt said. "Not in Sochi, nor anywhere else in the world."